PowerPoint Add-In to manage all your PowerPoint-Slides, Pctures and grafics. 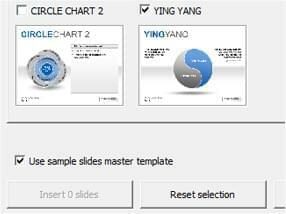 Slide-management tool for PowerPoint - an intuitive easy-to-use add-in which helps with the management of company presentations and the organisation of sample charts. The add-in for Microsoft PowerPoint (2007-2019 and Office 365) assists you to manage your company's templates and sample charts in one centralized SlideLibrary. 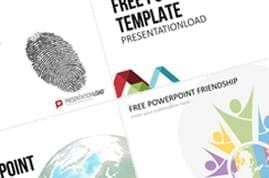 With this tool you can let your employees and colleagues directly access certain slides in your company-specific corporate design for the creation of individual presentations. Multiple libraries can be easily and intuitively managed through a dropdown menu. With our SlideLibrary your company's employees receive an intuitive managable tool for the creation and organisation of CD-conform individual PowerPoint presentations. 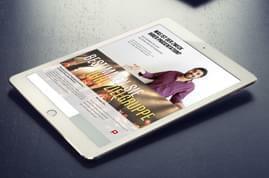 All of your templates will be in your company-specific corporate design and can easily be filled with new content. 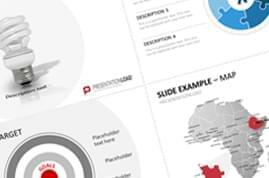 Pre-defined layouts such as company slides with up-to-date facts and figures can directly be integrated in any presentation. 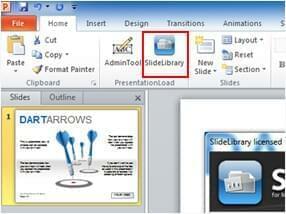 After the program installation the user can access the SlideLibrary directly through a button in the PowerPoint toolbar. The slide administrator can monitor through an additional button in his toolbar. 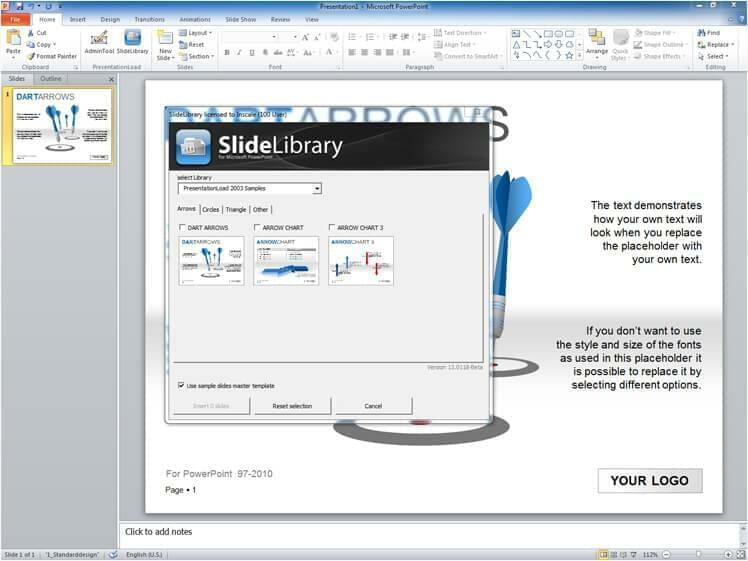 With one "click" you can access this application in PowerPoint. The portfolio of individual slides, which may be organised in categories, is presented through small picture icons (thumbnails) in the SlideLibrary. The organisation in categories can be catalogued in two levels (presentation based or category based). Each category may contain an infinite number of templates. Any number of templates may be taken out of each tab. 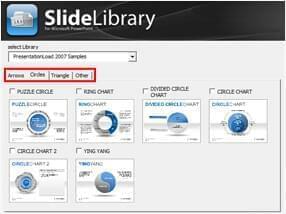 In the last step you can insert your chosen charts from the SlideLibrary with only one click into your current presentation. You may also transfer your master template in this step if you wish to do so. You receive the add-in "SlideLibrary" with 15 high-quality, vector-based sample charts. 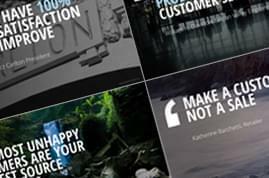 Save ressources: your employees do not need to develop new slides from scratch. Enhanced quality: always have the right content in the appropriate Corporate Design. The display of the thumbnails corresponds with the slideformat. The size of the thumbnails is adaptable through the admin-tool. 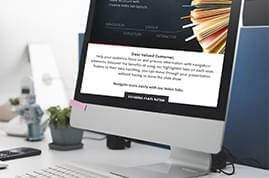 Choose to exchange the "SlideLibrary" banner with your company's logo. International: languages are available - the SlideLibrary will automatically adapt to your system's language. Easy handling: add-in is quickly installed ("one-click" installation). Several libraries: you may choose your specific library through a drop-down menu. Preview zoom: you can enlarge the thumbnails by simply touching your mouse. Download: Zip-file or .ppa/.ppam in a prefabricated exe-file. Please note: for technical and compatability reasons the add-in is not applicable with PowerPoint versions for a Mac.